In March of 1781, British sailors guarding the mouth of Pensacola Bay spotted a ship that they hoped contained their reinforcements. But instead of the Union Jack, the red and gold stripes of the Spanish navy were flying over the lead ship. The Spanish invasion of British West Florida had begun. Histories of the American Revolution seldom mention Spain’s involvement and their defeat of the British in Florida. Spain had seized a golden opportunity to expand their holdings in North America while England was busy putting down the rebellion. To the people living on the Gulf Coast, the Revolution seemed to be like most wars, a war fought for territory and treasure. They had little interest in Britain’s attempt to tax and control its colonies. The area was populated by British, French, Spanish, Creeks, Chickasaws, Choctaws, and African born, slave and free. People chose sides for reasons other than revolutionary fervor. This book looks at the American Revolution from an entirely different perspective as it follows the lives of individuals from these groups during and after the war. Among others, there was the slave Petit Jean who worked to help Spain; Payamataha, the Chickasaw leader who kept his people neutral; Scottish loyalist James Bruce, a British official in Pensacola; Oliver Pollock, a New Orleans businessman who spent his fortune helping the colonies. Incorporating the stories of real people made this read like a novel. I came to care about these people and want to know what happened to them. The history began to live, became much more than dates and battles, words in a book. This was a very interesting item to add to my collection of little known history. Highly recommend for adults and teens. 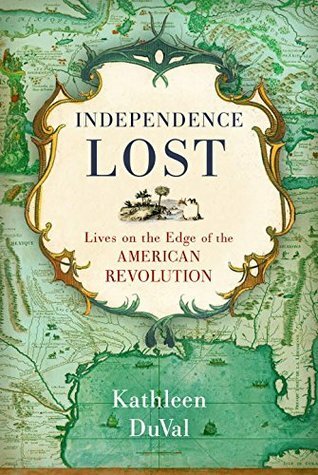 This entry was posted in adult, highly recommend, nonfiction and tagged American Revolution, Gulf Coast, history. Bookmark the permalink.